Duplication involves the burning of your data onto recordable discs . Troy Horse boasts a complete, in-house Duplication service. 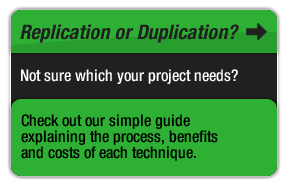 This method is great for runs of up to 500 units and Troy Horse has no minimum quantity for duplication orders. Replication is the process of creating a glass master of your project and then reproducing the discs using a commercial pressing and printing method. 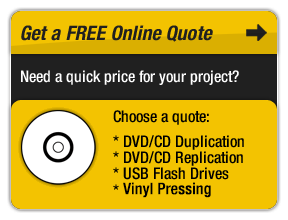 The end result is of equivalent quality as discs purchased in retail outlets, such as a CD by your favourite band, a classic film on DVD or the latest software for your computer. The minimum run using this method is 500 units. DVD's that are duplicated i.e. burnt rather than pressed may have compatibility problems with a small number of set-top players. 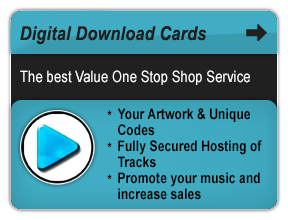 Troy Horse uses the DVD-R format for DVD duplication as this format is the most widely supported by hardware manufacturers. Latest figures indicate a compatibility of 95% of players for the DVD-R format. If full compatibility is important to you should consider having your discs replicated.